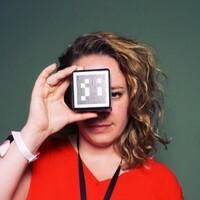 Immersive story producer Nienke Huitenga (1984) has been designing interactive experiences since 2011. She was awarded a Dutch Oscar (Gouden Kalf) in the Best Interactive category in 2016 for the online science fiction story THE MODULAR BODY, directed by visual artist Floris Kaayk. She has been collaborating with Kaayk since 2011, creating media strategies. Their first success was the hoax of Human Birdwings (2012). This transmedial story reached an audience of millions, and fooled the Myth busters and physics’ professors on WIRED. Because she believes so strongly that the stories we tell matter, she founded Hackastory in 2013, a company that guides journalists and newsrooms to innovate the way we tell and experience the news. Currently she is also working on a VR experience titled ROZYSPNE, story about Nina, an old lady trying to preserve daily life in the Eastern-Ukrainian warzone, with the MH17-crash at her doorstep. It is going to premiere end of March in Brussels.